Penelitian tentang Pendekatan Feminist Communication Theory pada Cybercommunity “Wacana Cerdas Menonton Televisi” di internet berasal dari pengamatan tentang fenomena aktivitas percakapan para perempuan di e-forum Cerdas Nonton Televisi di internet yang memuat kondisi pertelevisian Indonesia di mana di tuang ini ditemukan masalah bahwa internet dengan facebook nya telah membangun suatu hubungan dan wacana para anggotanya secara terbuka, lugas, dan kritis, tanpa melihat status, gender, ekonomi, sosial, agama, dan gaya hidup tentang krisis televisi tanah air yang masih memiliki banyak masalah, baik pada penyiar, produser maupun berita atau program-programnya. 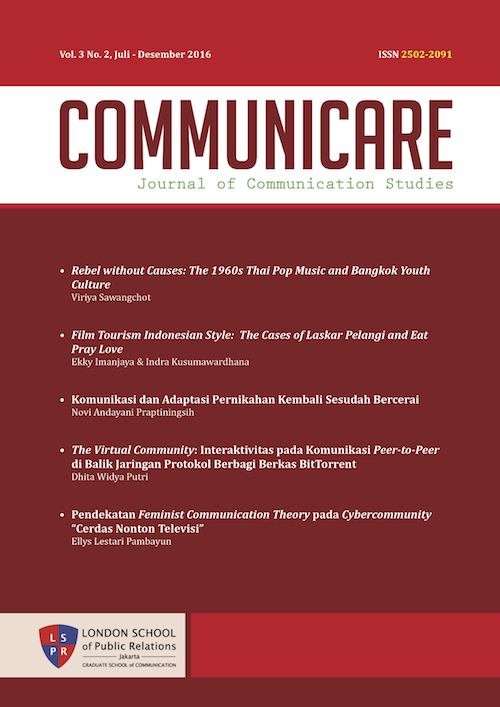 Teori yang digunakan adalah paradigma kritis dengan salah satu variannya yaitu feminist communication theory yang bertujuan untuk melihat representasi perempuan di ruang publik yang menyuarakan atau mengkomunikasikan semua aspirasi, rasa keadilan, dan keberadaan mereka. Tujuan penelitian adalah untuk menganalisis cybercommunity perempuan di e-forum ”Cerdas Nonton Televisi” yang menyuarakan atau mewacanakan permasalahan pertelevisian Indonesia. Secara metodologis, penelitian ini menggunakan metode netnografi untuk melihat aktivitas budaya komunitas maya perempuan dalam bentuk percakapan di internet. Hasil pengamatan ini memberikan deskripsi bahwa para perempuan dalam e-forum Cerdas Nonton Televisi (CNT) ini telah berupaya mengoptimalisasikan ruang CNT untuk berkomunikasi atau bersuara kritis bagi terciptanya reformasi pertelevisian untuk lebih prokhalayak dan mencerdaskan bangsa. Namun, suara kritis perempuan masih lebih sedikit dibanding suara laki-laki dalam berwacana dalam ruang CNT ini. Selain, itu suara perempuan yang muncul lebih banyak pada hanya mengikuti status laki-laki, dibanding membuat status sendiri. Pada sisi substansi kritisisme perempuan pun cenderung menyiratkan keprihatinan secara emosioanal dibanding pada pengupayaan ke arah tranformasi secara nyata. Research on Feminist Theory Communication Approach on Cybercommunity “Cerdas Nonton Televisi”(CNT) on the Internet comes from the observation of the phenomenon of conversations activity of women in the e-forum CNT which contains conditions on Indonesian TV in the room where it was found that the problem with the internet (facebook) it has built up a relationship and discourse of its members openly, straightforwardly, and critical, regardless of status, gender, economic, social, religious, and lifestyle on television crisis that the country still has many problems, both on the broadcaster, producer and news or programs. The theory used is critical paradigm with one of its variants, namely feminist communication theory which aims to look at the representation of women in public spaces are voiced or communicate all the aspirations, sense of justice, and their whereabouts. Television” are voiced or mewacanakan issues on Indonesian TV. Methodologically, this study using netnografi to see the virtual community cultural activity of women in the form of a conversation on the internet. These observations provide a description that the women of the e-forum Smart Watch Television (CNT) has sought to optimize this space to communicate or speak CNT critical for the creation of television for more prokhalayak reform and educate the nation. However, critical voices are still fewer female than a male voice in the discourse in this CNT space. In addition, the voice of women who appear more on just follow the status of men, rather than making their own status. On the substance of the criticism of women also tend to imply concern is emosional than at the insistence towards real transformation. LESTARI PAMBAYUN, Ellys. Pendekatan Feminist Communication Theory pada Cybercommunity “Cerdas Nonton Televisi”. Communicare, [S.l. ], v. 3, n. 2, p. 73-92, mar. 2018. ISSN 2502-2091. Available at: <http://journal.lspr.edu/index.php/communicare/article/view/20>. Date accessed: 18 apr. 2019.